Have a 1999 Pennsylvania quarter and want to know what it’s worth? Here’s some good news… If you’ve got any 1999 Pennsylvania quarter errors, you may have struck it rich! Today I’m going to help you determine how much your Pennsylvania state quarters are worth. 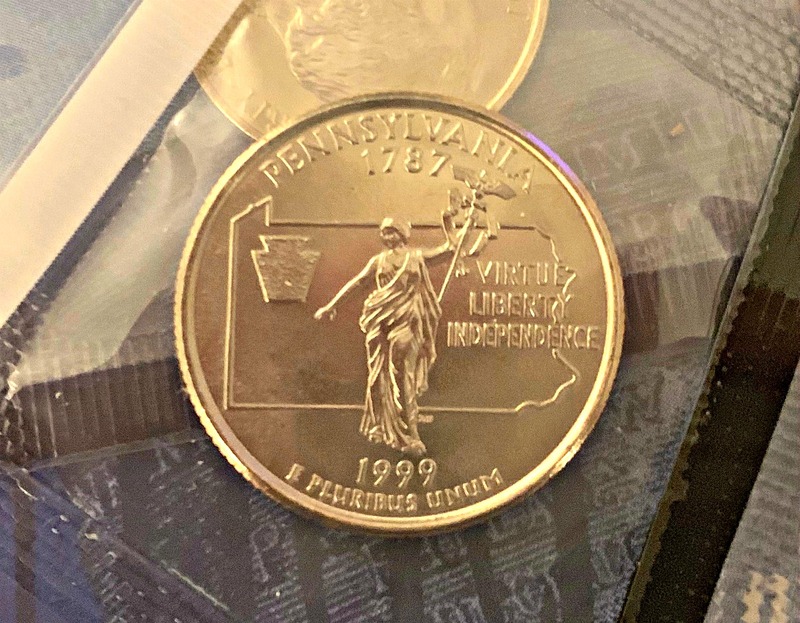 There are many types of 1999 Pennsylvania quarter errors — ranging from minor and not very valuable to the dramatic errors worth thousands of dollars. First, I’m going to tell you about the most valuable 1999 quarter error. It is perhaps the rarest and most valuable of all that were struck on experimental planchets, or coin blanks. Only a few of these coins are known to exist. They were struck on blanks of various metal compositions. Many experimental planchet quarters were struck on blanks consisting of copper and zinc and appear similar in color to Sacagawea golden dollars. One such Pennsylvania state quarter error sold in 2003 for $6,325. Experimental alloy state quarters from other states have sold for as much as $10,000 — depending on the state, the composition, and condition of those rare coins. Okay, so maybe you don’t have one of those rare Pennsylvania quarters. There are still many other kinds of valuable Pennsylvania state quarter errors worth looking for! 1999 doubled die Pennsylvania state quarter — Depending on condition, intensity of the doubling, and location of the doubling, 1999 doubled die Pennsylvania quarters are worth anywhere from $5 to $20. Some may be worth even more, if they prove rare and create a demand among coin collectors. 1999 Pennsylvania state quarter with die crack — The value of an error coin with a die crack or die break varies, depending mainly on the size or intensity of the die crack and its location. Many quarters with die cracks are relatively insignificant varieties worth only $3 to $5. But if the die crack is particularly large, is a scarce error, or the location interferes with a prominent part of the design (such as Washington’s face or the Pennsylvania state outline), it could be worth $25 to $50 or more. Off-center 1999 Pennsylvania state quarter — These error quarters usually vary in value from $5 to $20, with the bulk only a few percent off from center. However, off center errors (25% to 50% or more) are quite rare and worth many times more! Weakly struck Pennsylvania state quarter — A 1999 Pennsylvania state quarter with a weak strike may not be worth more than common book value. However, die trial errors (which can be worth hundreds of dollars) or strike-through error coins often trade for $50 or more. 1999 Pennsylvania state quarter with clipped planchet — Clipped planchet errors are fairly common and can bring anywhere from $10 to $25, depending on the severity and size of the clip. NOTE: All error coins and error varieties are, by definition, unusual. So they don’t typically carry a “book” value like regular coins do — because they aren’t as common, generally aren’t widely traded, and appeal to a relatively small base of collectors. Therefore, the values listed above for 1999 Pennsylvania quarter errors are only rough estimates and may be higher or lower than the prices you could actually buy or sell them for. How Much Are Pennsylvania State Quarters Without Errors Worth? Let’s say you’ve gone through your pocket change and haven’t found any unusual Pennsylvania quarters. What next? Well, the frustrating thing when you’re looking for 1999 Pennsylvania quarter errors is that, yes, they are rare coins. That’s what helps make them valuable — and, therefore they aren’t necessarily all that easy to find. But that also enhances the thrill of the hunt! Regular specimens are generally worth face value if they’re worn — or 25 cents. The only 1999 Pennsylvania state quarters that are worth more than 25 cents are those that are uncirculated (never used as money). Uncirculated 1999-P and 1999-D Pennsylvania state quarters are worth about 50 cents and up. Copper-nickel clad proof 1999 Pennsylvania state quarters are worth $2 to $5 apiece, depending on their condition. 90% silver proof 1999 Pennsylvania state quarters trade for $5 to $10 each. Proof quarters were made at the San Francisco Mint and bear the “S” mintmark. They were struck only for coin collectors and were sold in proof sets. Pennsylvania was the second state recognized in the 50 State Quarter program, which ran from 1999 through 2008. The state quarter series honors each of the 50 states, and these coins were issued in the order that each state joined the Union. The Delaware quarter came first, followed by northern neighbor of “The First State,” Pennsylvania. The Pennsylvania state quarter was released on March 8, 1999 and was struck for about 10 weeks. The Philadelphia Mint pumped out 349,000,000 business strikes, while the Denver Mint produced 358,332,000. This makes a total of 707,332,000 Pennsylvania quarters made for circulation. The San Francisco Mint produced 3,713,359 S-mint proof copper-nickel clad Pennsylvania quarters for collectors. Additionally, there are 804,565 90% silver proofs. Who designed the Pennsylvania state quarter? The obverse (heads side) was designed by John Flanagan in 1932 and modified in 1999 by William Cousins. The reverse (tails side) was designed by John Mercanti. The statue on the reverse of the Pennsylvania state quarter is known as Commonwealth. The bronze-gilded statue, designed by New York sculptor Roland Hinton Perry, measures over 14 feet tall. It stands atop the Pennsylvania state capitol dome in Harrisburg, Pennsylvania and was erected in 1905. One of the most famous songs about Pennsylvania is “Allentown” — the eponymous eastern Pennsylvania city of 120,000 people whose socioeconomic decline in the 1960s and ’70s was profiled by Billy Joel in his 1982 hit song.